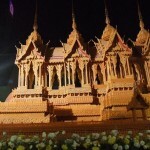 October 1st through October 4th will see yet another festival celebrating the end of Buddhist lent ( Ok Phansa ), The Sakon Nakhon Wax Castle Festival. 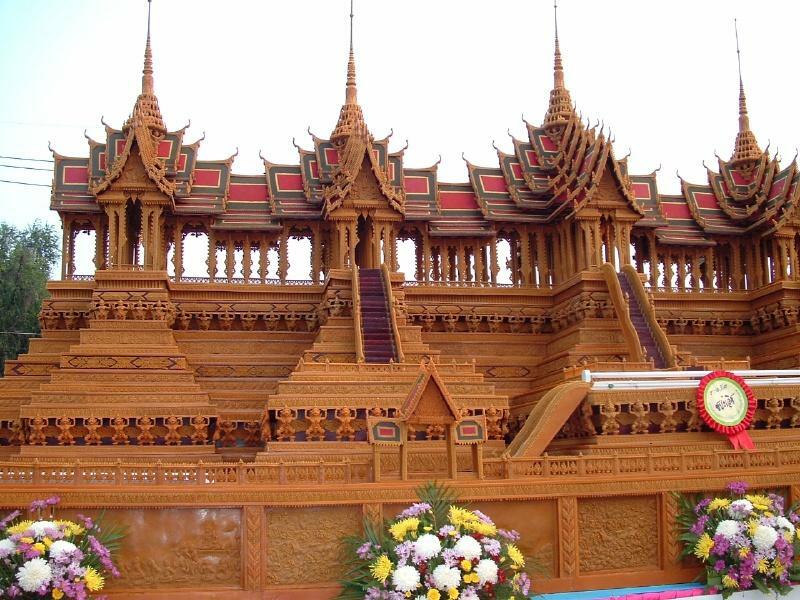 The ancient tradition passed down through the ages, originated with the people of Sakon Nakhon carving elaborate trees from poles made of bees wax that they would take to the temple as an offering to make merit. 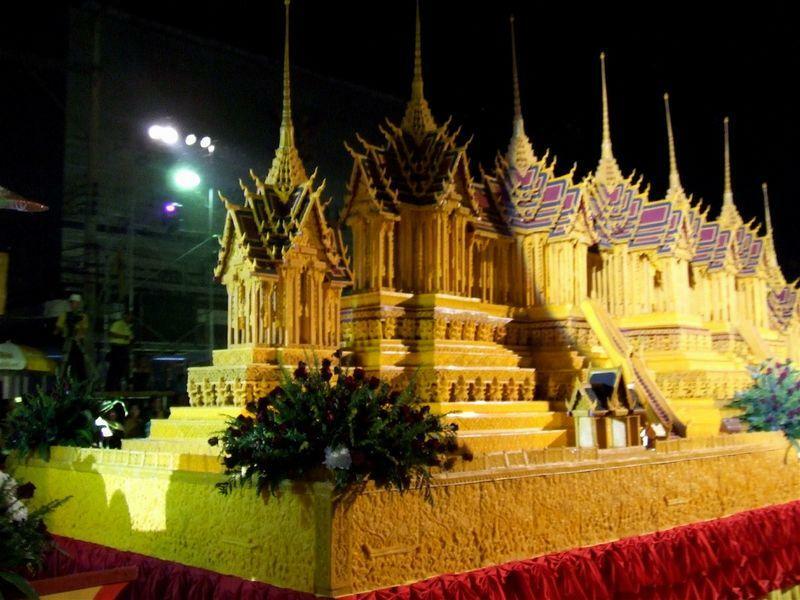 This tradition has grown over the years from ornate trees to elaborate carvings of Buddhist temples and shrines completely made from bees wax. According to Buddhist religion upon death a person passes on to another life, the quality of that next life is determined by meritorious acts and or good deeds performed in this life. If the person practices the principles of Buddhism and engages in acts of devotion in their life they will gain merit and that merit will accumulate and lead to higher spiritual enlightenment in subsequent lives where they will live in the upper tiers of heaven. If that person doesn’t gain merit then they will be reborn to a life that is worse than their present life. The wax castles symbolize the ideal spiritual life that one aspires to in the next life. 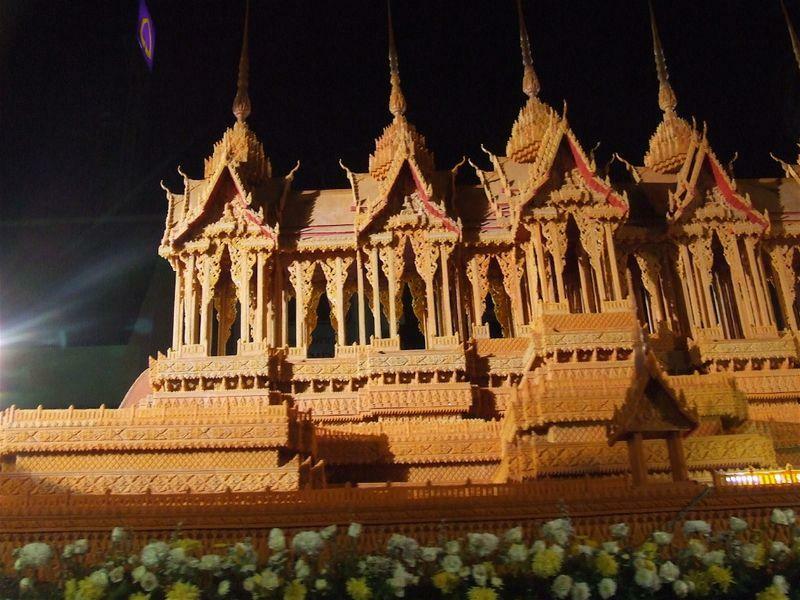 The wax castle festival falls into the Buddhist precept of merit as communal merit making. Many who are blessed with merit coming together for the greater good of the community. This is a special time of the year for families to get together and reunite in merit making activities. The family and community come together with the monks in an expression of Buddhist devotion that strengthens and bonds the family and community with the temple. 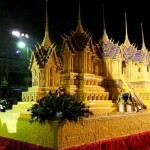 This is truly another Thai festival that must be seen. It’s four days of non stop activities includes the Royal boat parade, a light and sound show, a large community dinner and closing with the Wax Castle Parade. You can see videos below of the Wax Castle Parade last year. Excellent! Yet another reason for me to get off of this sofa and up and away from Bangkok. I won’t be around during that time but I will bookmark this post for next year. Megga. I hear ya Cat. I got an earful last night from the lil missus about missing the Naga festival, Boat procession and the wax candle festivals this year. I will be at them all next year though!